Stimulsoft team are pleased to announce the release of the new version Stimulsoft Reports 2017.2.3. This new version introduce new features which are the ability to publish reports to easily integrate into your applications, opportunity to store and edit reports in cloud, the new product Stimulsoft Reports.UWP, support for SVG images and many more. - The Cancel button when loading libraries in the Publish wizard. - The new static option - StiOptions.Engine.Image.RotateImageByExifOrientationData. - Caching scripts and styles on the server side for Web components. - The new PassQueryParametersToReport property for the HTML5 viewer, if to set it to true, the parameters from the URL will be automatically applied to the report. - Ability to delete the elements of the dictionary by clicking the Del key. - Designer WinForms, Designer Wpf, Designer WpfV2. The following data dictionary options are moved to a separate submenu - Create Fields on Double Click, Create Label, Use Aliases. - Designer WinForms, Designer Wpf, Designer WpfV2. In the editor of the text component, the verification of the entered expressions is now automatically performed when the text is changed. - The BreakIfLessThan property for the Data band in the designer. - Interaction to the context menu in the designer. - WPF/Winforms designers. In ReportTree, you can immediately edit events by double click. - Add No Fill button to color dialog in the designer. - The NumberOfCopies property to the page in the designer. - Mobile interface mode for HTML5 viewer. - Markers to interaction form in the designer. - The mobile mode of the interface for WebViewer. - Saving and loading encrypted reports in the Cloud. - A new display of markers for the series of the chart. - The ProcessingDuplicates property now works more correctly in the Based on Value and Tag mode. - If to connect assemblies of additional themes to the designer WpfV2, and select any theme (except Office 2013), the designer crashed with an error when loading. - Viewer: The EditReport button could cause an error in some cases. - An error occurred when there was no internet connection in the Publish wizard. - The name of the output file of the package in the Publish wizard. - In StiViewerControl, the problem with obsolete properties ShowComboBoxZoom and ShowExport is fixed. - A bug with the Aspect Ratio property of the Image component. - Export to HTML. In the AllowHtmlTags mode, all characters of the UnicodeCategory.OtherLetter category (for example, Arabic, Chinese, etc. languages) were not exported. - Problems with the positioning of tooltips in the toolbox of the designer. - The page margins (0,0,0,0) in the JSON format were incorrectly saved. - Sometimes the text was rotated incorrectly. - The PrintOn property for panels did not work correctly. - A bug with dublicating names of categories in the dictionary. - A bug with coping text in the report checker. - A bug with login form from preview mode in the designer. - Viewer. When drawing the StiImage component, the ObjectToDraw property was not taken into account. - The Child band in WebDesigner. - Drawing financial series with styles. - Work of the Show Shadow property of the style of the PieChart. - A bug with the new query button in the designer. - TextInCells was not correctly exported, if the PageNumber or TotalPageCount was used in the expression. - A bug with positions of tooltips in the toolbox of the designer. - The error on variable is initialized by an empty expression. - A bug with the icon in the report designer. - Incorrect report designer form border in Office2007 and Office 2013 GUI modes. - Check for empty RouteData in the NetCore viewer component. About Stimulsoft. Stimulsoft specializes in the development of reporting tools for different platforms. Customer satisfaction is our first priority and as such we aim to produce top quality software. Application development is not always easy, but we do our best to help developers to incorporate into their applications the most advanced technologies available on the market today. 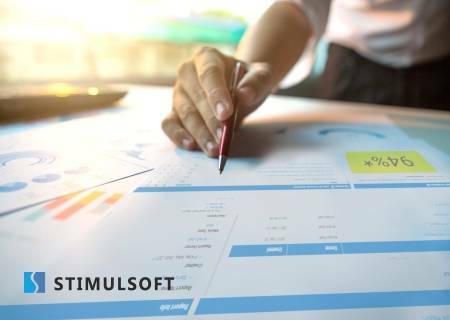 Reporting components from Stimulsoft combine functionality that simplifies and shortens the development cycle of business applications. Using them the client gets powerful data processing and visualization. Customers of the company are large and small commercial organizations, government, and educational institutions in more than 140 countries.